The 21st century central banker is a unicorn chaser. This has happened by default, a product of too little success despite ever-increasing interventions. 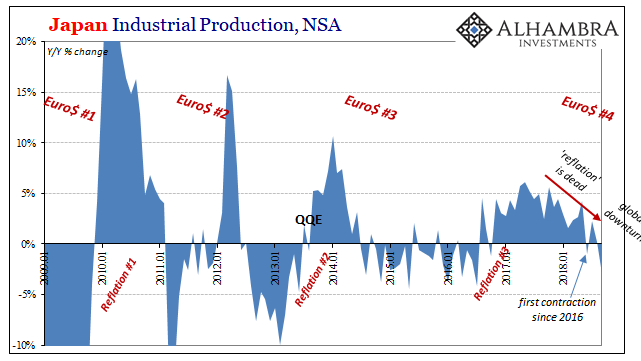 In fact, the bigger these policy intrusions become the more likely it is the central bankers will attempt to turn something small into something big. It doesn’t matter that economies are noisy by nature. The best example is found in Japan. Always Japan. The country’s central bank, BoJ, has been at it for almost thirty years. Five and a half years ago, officials would leave all that past behind with a “novel” approach in the form of QQE. It was an almost immediate failure, boosted in October 2014 just a year and a half into a program that was forecast to exceed its goals within two years. Central bankers have tried to argue time; they now say that these non-standard monetary policies simply need enough time to work. The most potent programs ever devised, supposedly, are slow-acting time-release. In 2017, as Economists worldwide predicted globally synchronized growth, Japan’s unemployment rate fell 0.3 points. It began the year at 3.0% and ended it at 2.7%. In January 2018, however, the rate would fall that much in just the single month. It was a startling development, a sudden 2.4% rate that would make policymakers delirious with optimism. Tokyo is rife with visible signs of a labor crisis. Job advertisements plastered on the windows of restaurants, retailers, and train stations – all desperate for new staff – are a staple of the urban landscape. In particular, workers from labor intensive fields and low-skilled job hunters are spoiled for choice. The day after those words were published, Haruhiko Kuroda, BoJ’s top official, stunned the world when for the first time he openly talked about ending QQE. Success was within his grasp, he claimed. Right now, the members of the policy board and I think that prices will move to reach 2 percent in around fiscal 2019. So it’s logical that we would be thinking about and debating exit at that time too. The world’s media, technocratic idealists all, joined in the celebration declaring this was really it. The party was, as you might guess, entirely premature. Just four months after Kuroda’s unrestrainable giddiness his colleague Yutaka Harada, a BoJ board member himself, was abruptly pouring cold water all over the whole affair. Japan’s unemployment rate would fall to 2.2% in May, the Ministry of Internal Affairs and Communications would confirm. And yet, monetary therefore economic success was somehow more distant. How quickly things change if you are hunting unicorns. And if you think he was talking exclusively about Japan’s unemployment rate you are kidding yourself. 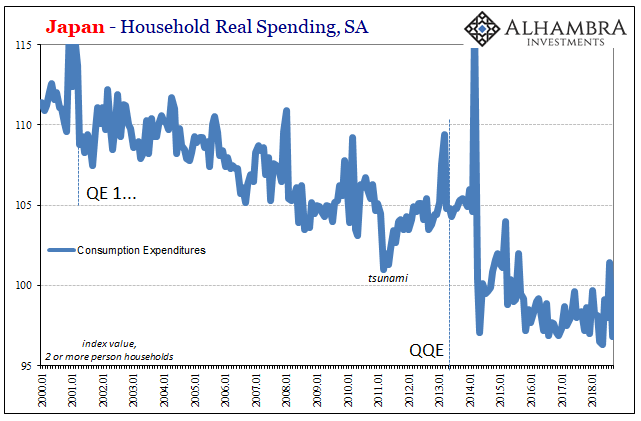 Central bankers everywhere are struggling to understand why what they all thought they thought never seems to apply in the real world. 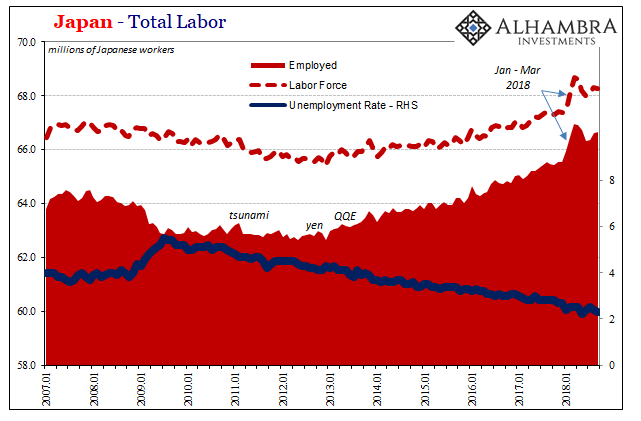 On a DSGE model employed by the Bank of Japan as well as the Federal Reserve, full employment means something. A big part of the problem is these unicorns. Something happened in Japan’s labor market earlier this year, although exactly what that was isn’t determined. Kuroda and BoJ officials declared it was QQE’s success finally showing up. They take any small and infrequent positive to mean that same thing every time. There was a burst of demand for Japanese labor. But it has proved over the months since then to have been a temporary one. Heralding nothing but more noise, Japanese policymakers were getting way ahead of themselves. The walking back from their dizzy positions early this year mustn’t have been pleasant, but at least it is something they all should be used to by now. For one thing, that three-month period was so unusual it practically dismissed itself as an outlier (and it could be a statistical one tied to the 2015 Census changeover). 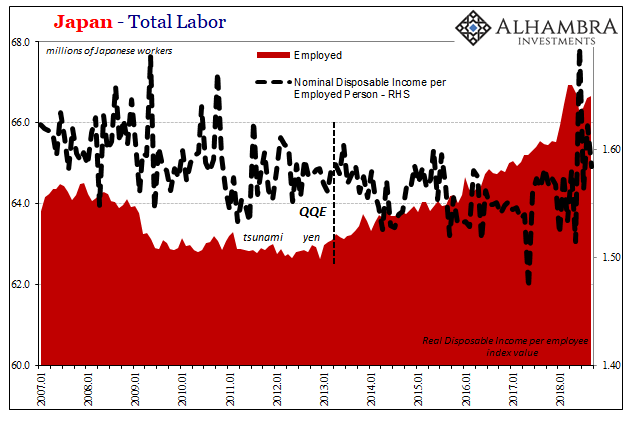 The baseline labor market condition has been, since QQE, one of deterioration by other means. As you can see on the chart above, the more employers in Japan hire new workers, the less these workers in the aggregate get paid. In real terms, this disparity is enormous. More workers working and somehow less aggregate income. 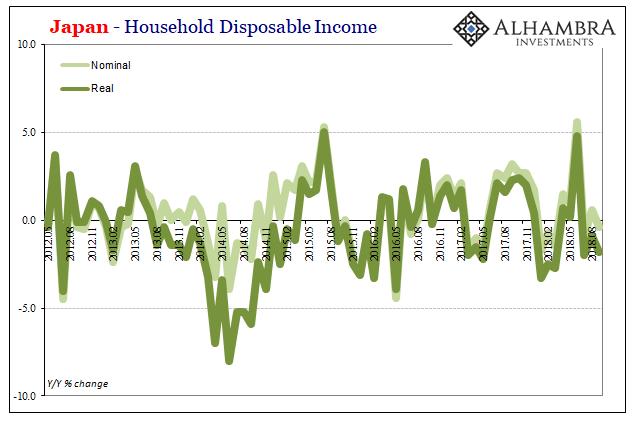 The big jump in disposable income in June was the bonus payments related to the employment outlier in Q1. It, too, was transitory. Disposable income in Japan in real terms has contracted year-over-year in each of the three months since (including the latest data for September, released today). Nominally, aggregate incomes fell in two of those three months (July and September), barely positive in the other one (August). What central bankers should’ve focused on was this last half-decade rather than the one short three-month period. They should have been all along trying to puzzle out why Japanese businesses have been substituting workers for hours, and what that really means. In other words, yes, they hire more workers but then they work everyone less for the number. It’s an astounding result, and one that shouldn’t be continuously ignored. 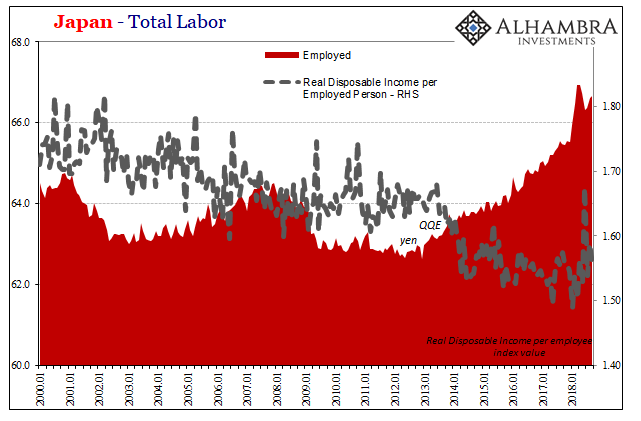 The answer to the inflation piece of the unemployment rate is right here. In lieu of actual pay raises consistent with a truly healthy economy, Japanese firms are refusing to give them and instead bringing on new and cheaper workers to supplement and even take away (again, lower total hours in the aggregate) from existing employees who obviously cost more. Deflation. For workers meaning consumers, it’s the opposite of a healthy labor market. And they know it. How do we know they know? Spending. Yes, Mr. Harada, “the decline in the unemployment rate is insufficient.” Furthermore, it is your job to figure out why and what it is that might be causing Japanese businesses to act this way. Five and a half years suggests this isn’t some temporary condition like the January – March “labor shortage.” It is the actual destructive baseline underneath Japan’s real economy, the one that has kept the lid on the economy and will keep doing so despite the occasional upswing noise. For labor-strapped companies, investing in labor automation is a popular choice, as it allows employers to cut labor costs rather than beefing up employee pay packets. In Tokyo, supermarkets are adapting to the lack of personnel by introducing automated cash registers while family restaurants and delivery services are cutting back business hours. It’s not puzzling at all, simply because like in America or Europe there is no boom. These aren’t “labor-strapped companies” they are economy-strapped companies. Japan’s economy isn’t growing so they can’t afford to pay workers more. As noted above, they’ve even taken to cutting hours so as to hire cheaper workers in replacement. Many of those are, sadly, the elderly. “The world’s third largest economy currently employs 65,600,000 people, and although approximately 30 percent of the population is over the age of 65, more than half of people within the 65-69 age bracket are currently working.” These are not older generation Japanese who remain working, no. Japan’s workforce is growing despite the working-age population having shrunk for 68 straight months. Does this sound like economic success in any way, shape, or form? Older Japanese are entering the labor force for the first time because they are clearly uncertain about their own economic future (spending) and Japanese companies are only too eager to employ them so as to reduce their own labor costs, spreading out the dismal conditions far and wide. QQE was supposed to have kicked of a virtuous circle when at best it played no offsetting role as a vicious cycle developed in its place. 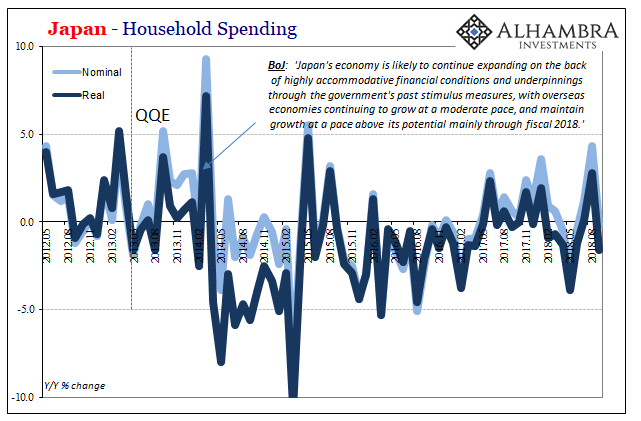 At worst, Abenomics with QQE as a big part may be responsible. Kuroda and Harada are having a hard time figuring out why inflation isn’t showing up after more than five years of QQE. And that’s not even the worst of all this. 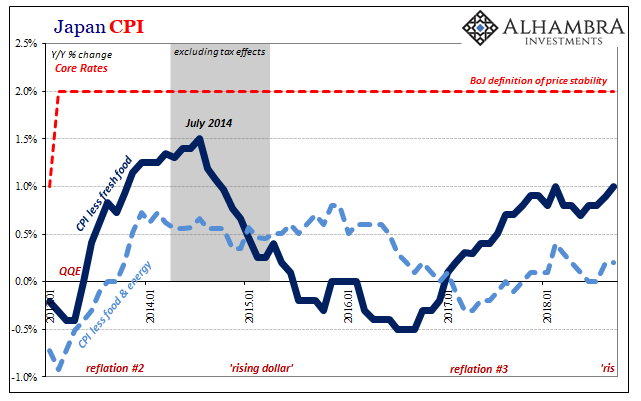 While they’ve been off chasing these precious few unicorns the entire global economy has begun to tilt back in the wrong direction (eurodollar #4). Reflation has ended. In other words, everything described above was, for Japan as everywhere else, the best of times.